On Aug. 30, Lady Gaga made an announcement that both delighted and disappointed us. 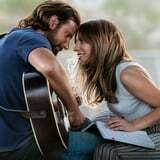 When it comes to the fourth remake of the classic Hollywood tale A Star Is Born, we have official confirmation that there will be a soundtrack full of blissful bops. Given the fact that Gaga belts it out in the trailer, we're not surprised. The album is replete with an electrifying 34 tracks to accompany the release of the movie, and there's even a full tracklist to get you all amped up. So what, you may ask, is the bad news? Unfortunately, we won't get to hear any of the music prior to the Oct. 5 release, as the soundtrack is set to drop on the same day. Then again, maybe it's a blessing; we can experience the magic of the music while we witness the moment on screen. If you like, you can preorder the soundtrack through whatever music service you use. Oh, and let's not forget the tracklist, which you can find below! "How Do You Hear It?" "I'll Never Love Again (Film Version)"
"I'll Never Love Again (Extended Version)"